Rhodes around New Delhi: The Best I Could Do! This is a long post, but it takes us to December. Hope you enjoy sharing some of our experiences through these pictures. 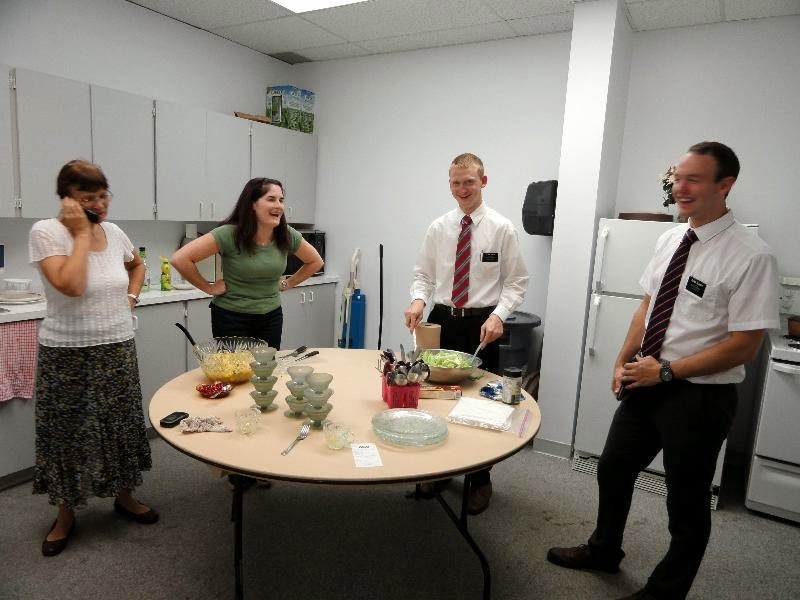 For the Women's Broadcast in October, Elder Smith and Elder Seaman made and served the sisters a delicious, gluten free pasta meal! Sis. Gisele Lacroix and Sis. Fabienne Racine putting a fruit salad together for desert while the Elders complete meal preparations. Our branch is so tiny and spread out, only three sisters were able to attend. Giselle and Fabienne spent the night at our apartment so they wouldn't have to make the 90 and 60 minute drives home that night just to turn around and drive back for church the next day. The broadcast was great and the company just as good! After Labor Day the Bourlemaque Gold mine only runs tours for groups of twenty or more. A man the elders were teaching managed to arrange a tour for only the six of us. It was a very unique and interesting experience. 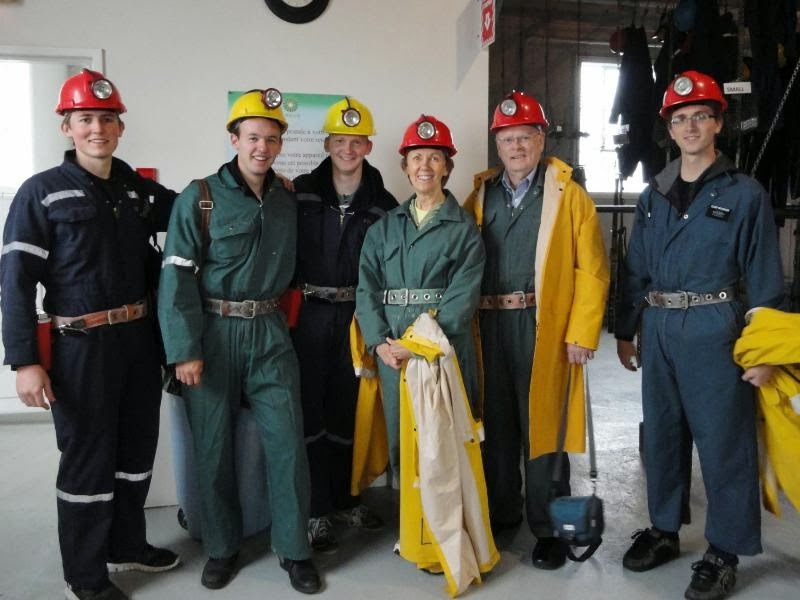 Before we went into the tunnel we had to get into mining gear. The raincoats were optional but it was a rainy day. 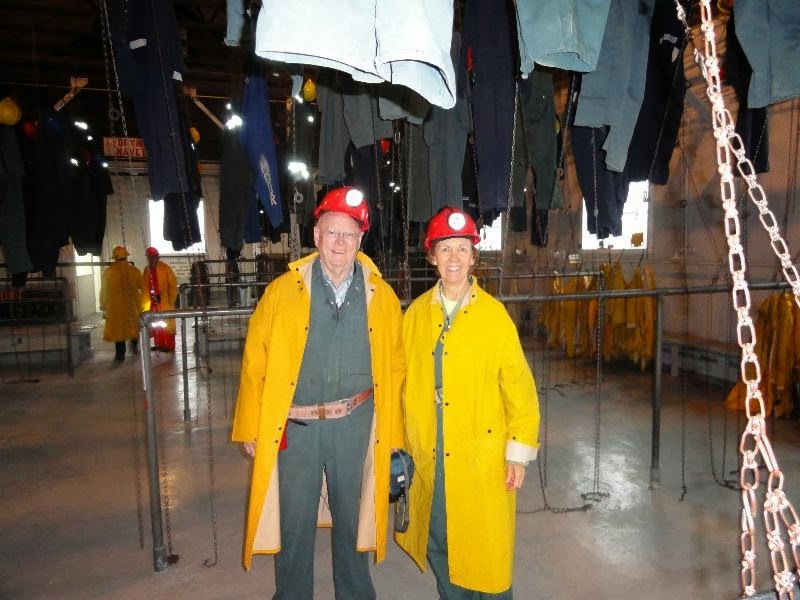 The temperature in the mine is a chilly 8 degrees so we layered up a little. 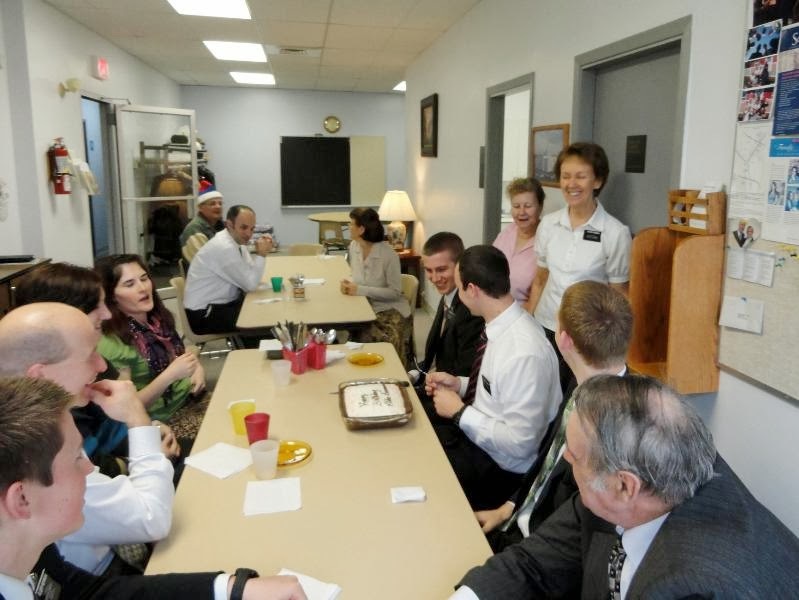 Elders Newman, Seaman, Smith, Rhodes, and Messinger, and Sister Rhodes. We were transported from the museum to the mine shaft in a sturdy mine vehicle of some sort. Elder Seaman and Elder Rhodes enjoying the ride. Elder Seaman always makes us laugh. You don't have to be French to translate the sign on the wall. Sometimes a poisonous gas will find its way into the tunnel. The tent has a hose that sends fresh air down into it from above ground. Two miners can go into the tent at a time to wait for the gas to dissipate. Miners are like missionaries - they always have to have a companion for safety reasons. Taking pictures down there was tricky. This is a good shot of a typical tunnel with atypical miners. Madame Gabrysz invited us to go to her cottage at Lac Blouin to see if it needed some work. She hadn't been there for two years. 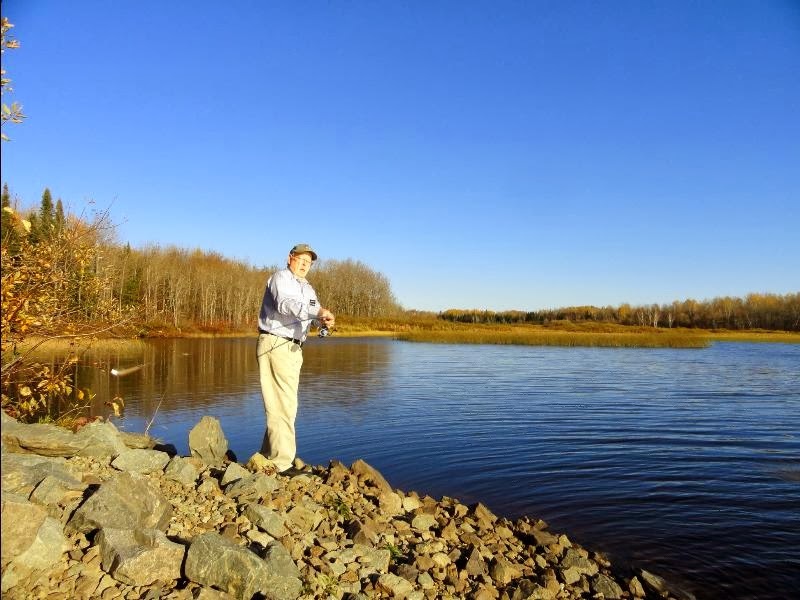 It's a beautiful spot with two cottages; the original one that came with the property and a lovely one they built when they bought the property about 35 years ago. 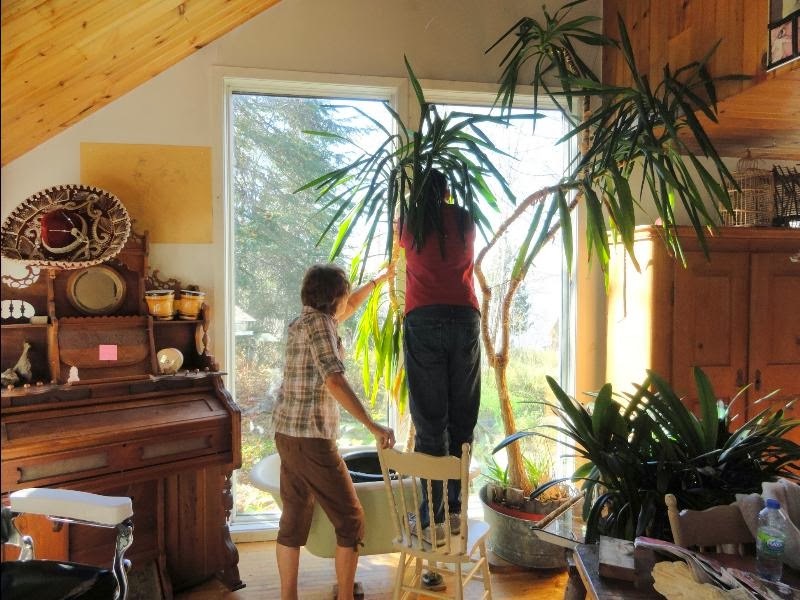 We all returned a few days later to give the cottage a good cleaning. Main floor of the main cottage before the cleanup. Tackling the main room. Mme. directing the work. 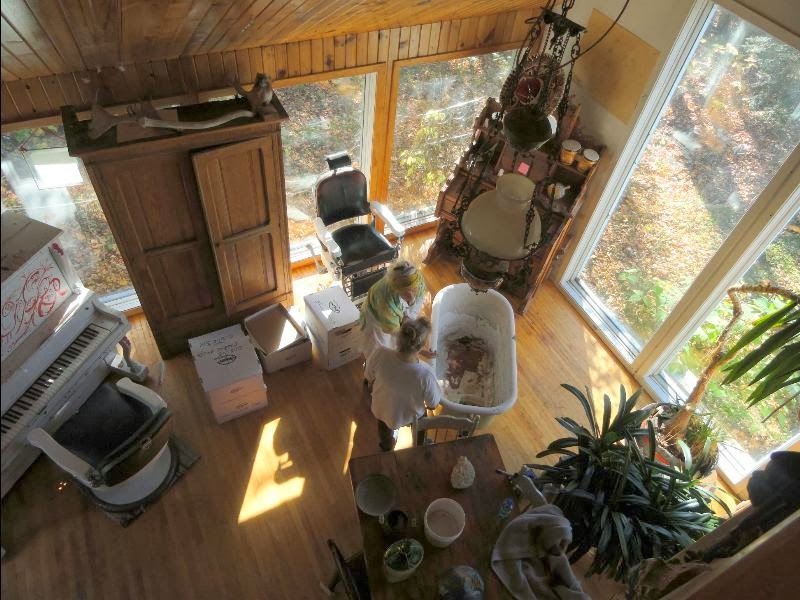 View from the loft as Nicole and Mme. Gabrysze trying to decide where to place the old bathtub. Nicole Lacert cleaning the loft. View from the main room. 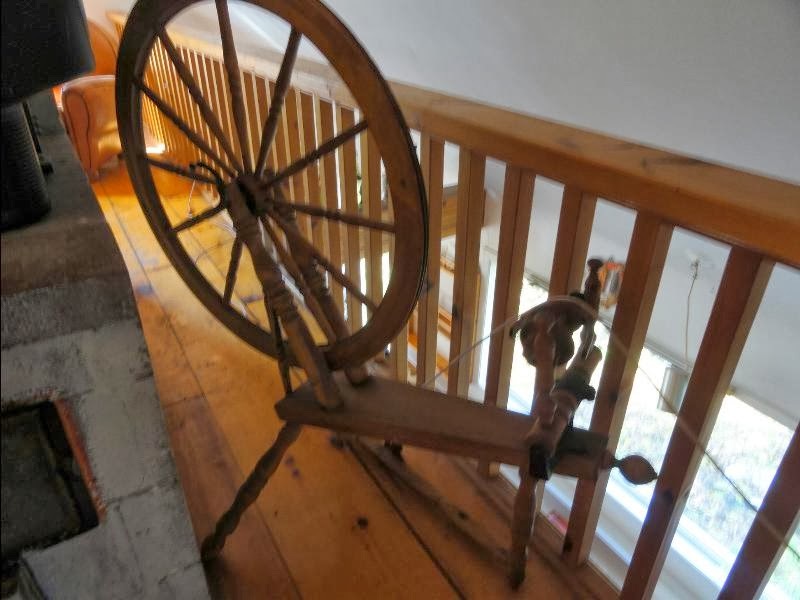 There are many antiques in this cottage. I love antiques! Moving the plants, using the tub as a planter. Notice the old organ in the corner. The spinning wheel in the loft. After the cleaning we had a picnic by the lake. It was a beautiful spot. Settling down for a picnic. The original cottage in the background. We took advantage of the location to find the leak in the air mattress. Thanksgiving was great! 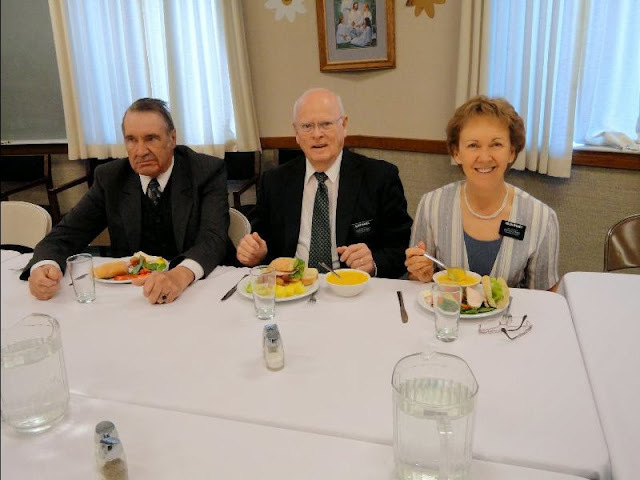 There were seven of us for supper - The Elders, Frank Fengler and me. Elder Smith and Elder Seaman made the buns and roasted vegetables. 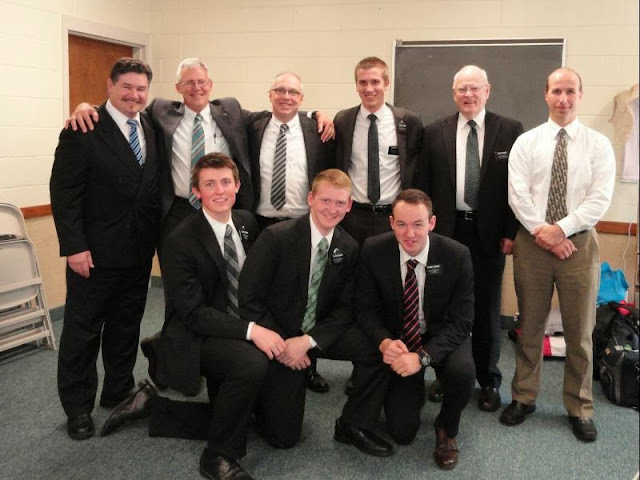 Elder Smith, Elder Newman, Elder Messinger, Elder Seaman, Frank Fengler, & Elder Rhodes. We also enjoyed turkey, stuffing, sweet potatoes, mashed potatoes, gravy, jellied salad and pies. Obviously we have plenty to be thankful for! There won't be room for desert! After we played the Clean-up game, we played 10,000. It was great fun! Next day was P-day. We finally got to do what we've been trying to find the time to do for weeks. 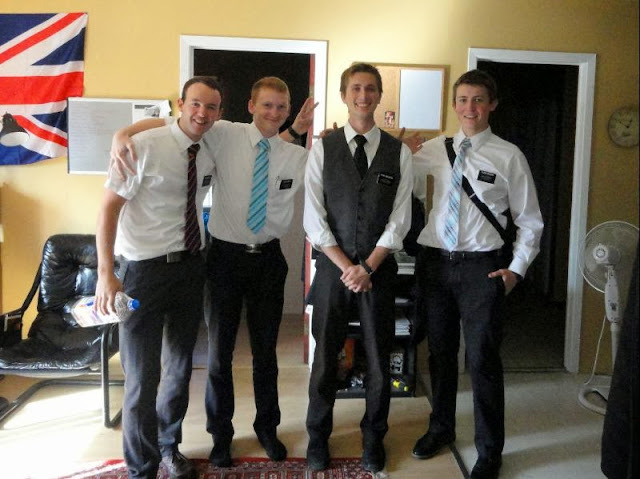 Elder Rhodes had stocked up on fishing gear from garage sales all summer, so we were all set. All three Elders got a bite, but unfortunately, no one actually caught a fish. Virtual hugs for an Elder who dislikes physical contact. But we love him anyway! Elder Fronk, on my left, replaced Elder Messinger. 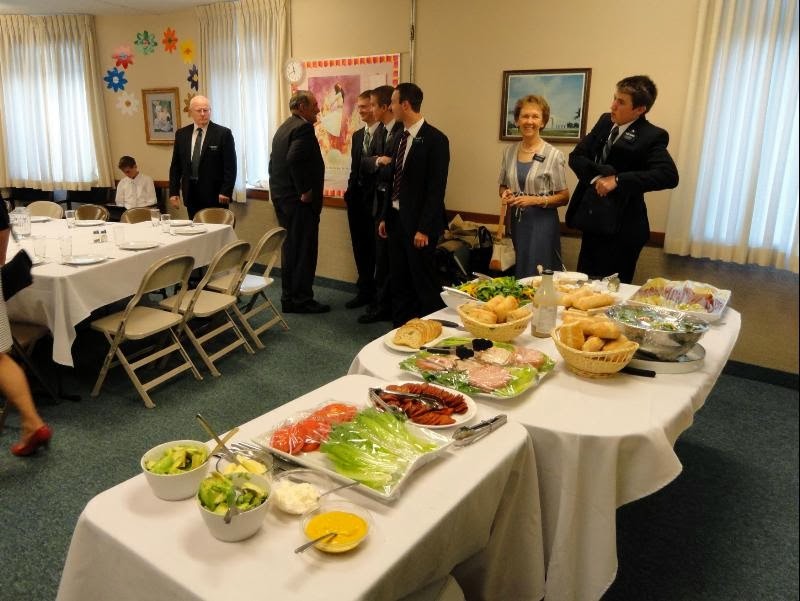 Our first district lunch with Elder Fronk, Chicken salad in pitas. 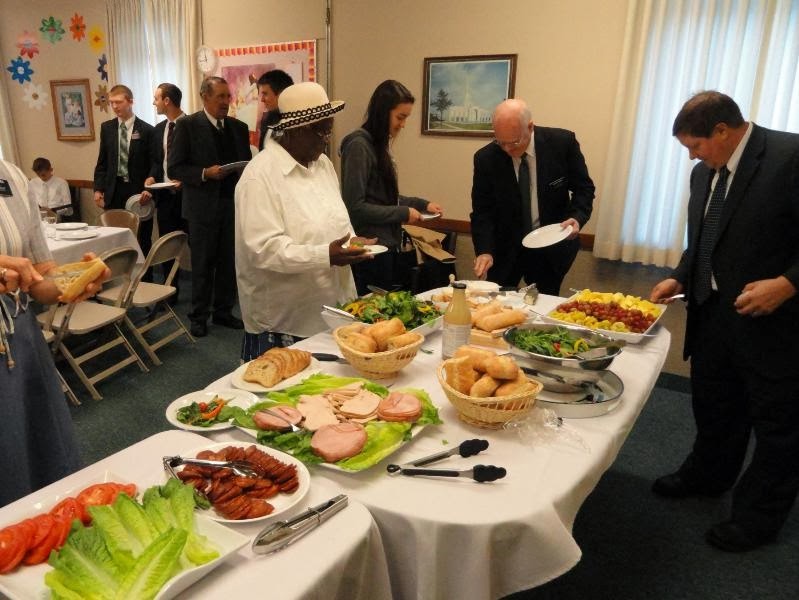 Stake Conference was held on Oct. 19th and 20th. We spent the night at Pres. and Sister Brulé's. 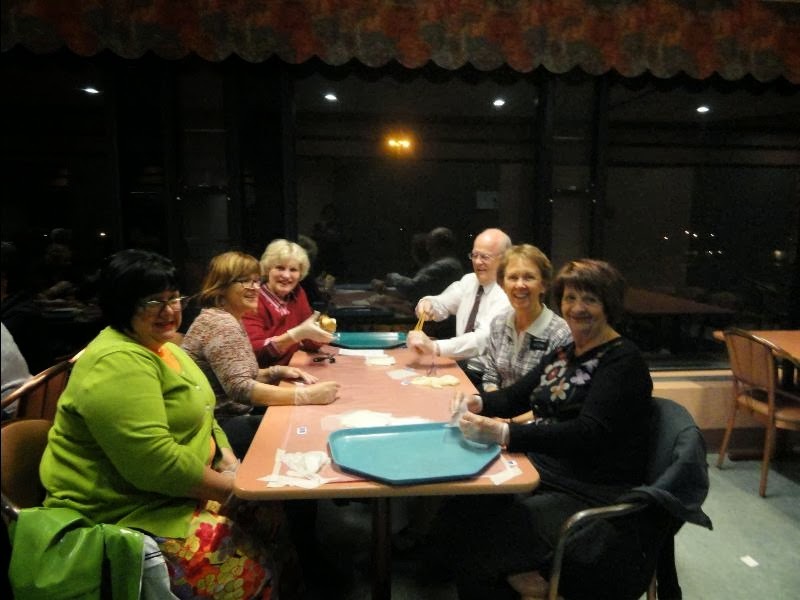 The people in the stake are so kind and there are many offers of accommodations for those who have to travel to Ottawa. We usually stay at the Brulé's. They're so hospitable and it's convenient for Pres. Brulé and Elder Rhodes to have a presidency meeting. Genevieve and I have become great friends. 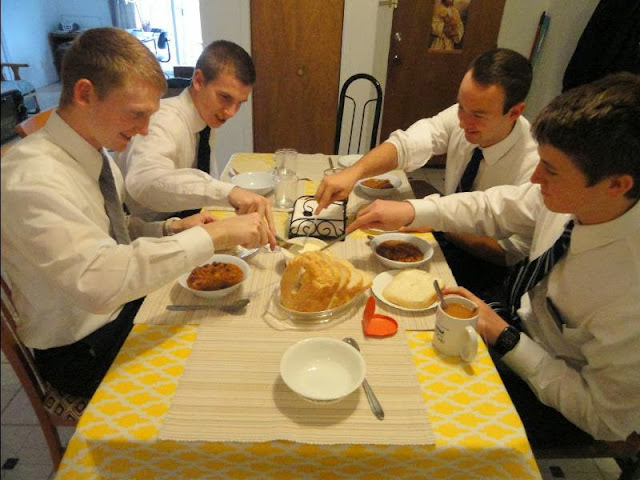 Elder Rhodes and I love the Brulés! Stake conference was great! The Sat. session was the most interesting and motivating member missionary themed meeting I have ever attended! It was definitely inspired! Sun. was just as good, especially when our mission president, Pres. Patrick spoke. He had just returned the night before from a meeting in Utah with general authorities on the subject and passed their counsel on to us. Except for the four on the left, these are those of our members who traveled five and a half to seven hours to attend conference. 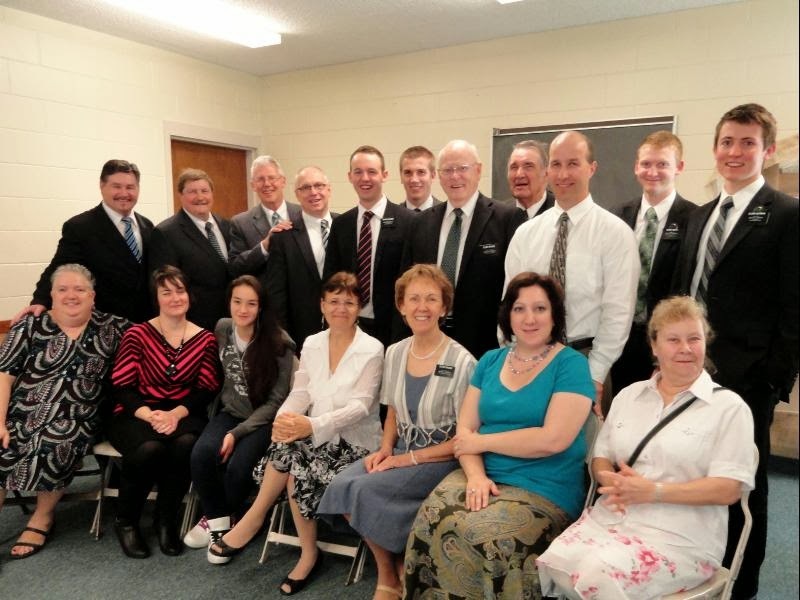 I'll never think Langdon is far from the stake center again. Front row: Sis. 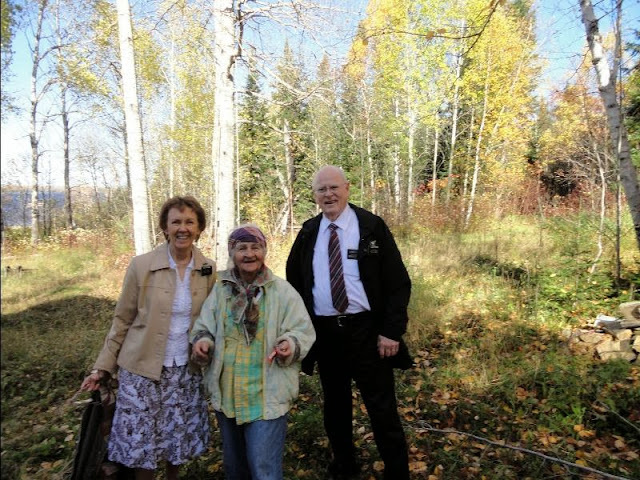 Brulé, Carolyn Simard and her daughter Cynthia, Gisele Lacroix, Sis. Rhodes, Sis. Ochs, Nicole Lacert. 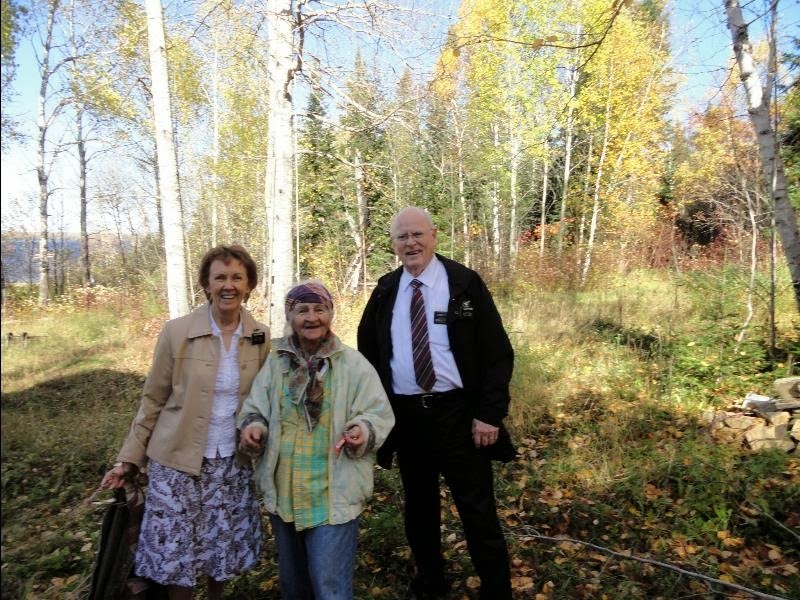 At the conference Elder Fronk was called to be the second counselor in the Abitibi Branch Presidency. What a grave responsibility for a young man! Hervé Ochs was called as executive secretary. He is also the branch mission leader. A handsome group of priesthood leaders! The stake always provides a lunch for those of us who travel far. They out did themselves this time! Lunch included three delicious home made soups. I loved them all! But my favorite was the spicy pumpkin soup. It was delicious! The Stake also fed the missionaries and other visitors and dignitaries. Our van was full for our trip to Ottawa. We enjoyed the company. I drove home. Elder Rhodes relaxed and enjoyed being chauffeured. Somehow we ended up taking a short cut which took us half an hour longer than normal to get home! (Does that sound familiar? Déjà vu!) It was an adventure! We did enjoy the unexpected ferry ride across the Ottawa river and the different highway scenery . The following day greeted us with some of the first signs of winter. 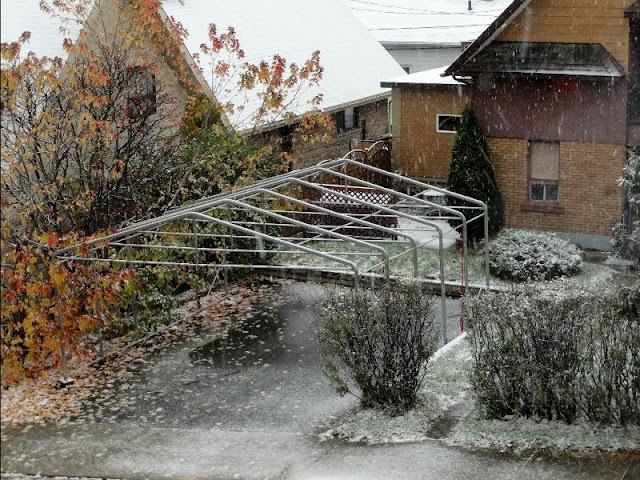 One of the earliest visible signs, usually preceding the first snowfall, is the raising of temporary vehicle shelters (tempos). You see them everywhere. They`re great! I wonder why they aren`t used more in Alberta. The elders were given a bread machine that they make great use of. Hot, fresh, home made bread was one of their contributions to district lunch that week. Diving in to the butter before the bread gets cold. Halloween was busy and fun. 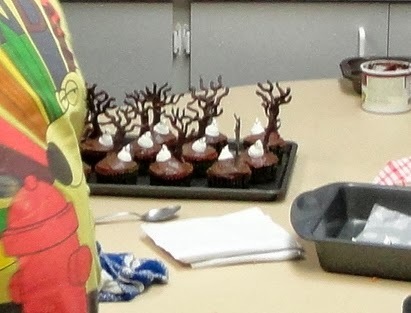 Some of the girls helped make the decorations and also helped with the decorating. 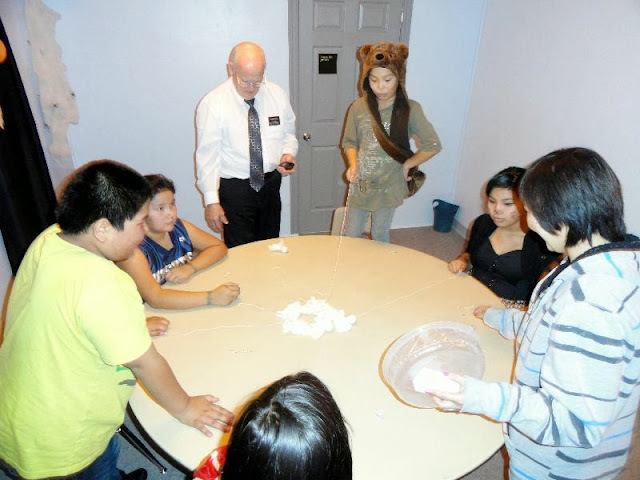 Thirteen children attended the party. We had a chili supper, played games and just had a good time together. The hospital advertises for volunteers to help with a fundraiser each year in November. They make taffy, cut, wrap, bag and sell it for Christmas. 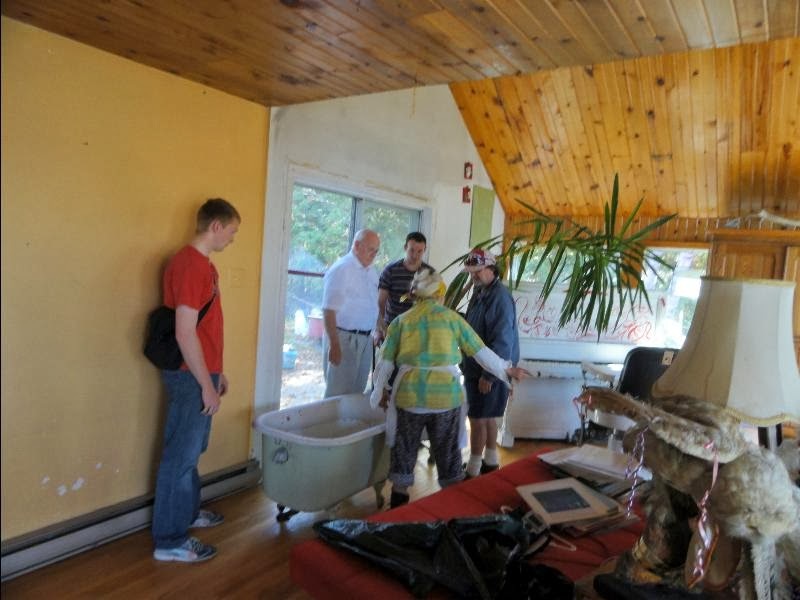 The Elders discovered the project and we joined them. We really enjoyed the evening. The volunteers were friendly and welcoming. One table was all bilingual volunteers so we could even enjoy the conversation. And we had an opportunity to answer some questions about the church, which we love to do. I keep telling people that Mormons love questions! The Elders mostly worked in the kitchen and delivered the hot taffy to the tables to be pulled and prepared. Elder Rhodes and I pulled, cut and wrapped. 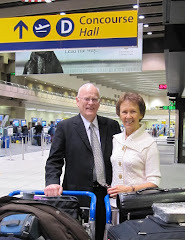 In the middle of November we went back to Ottawa for a Mission Conference with Elder Piper from the Quorum of the Seventy. He was wonderful. Both he and President Patrick taught with such insight that we all left with renewed purpose and dedication. Unfortunately we didn't get any conference pictures. While in Ottawa we finally got to visit with Maryanne and Ron. 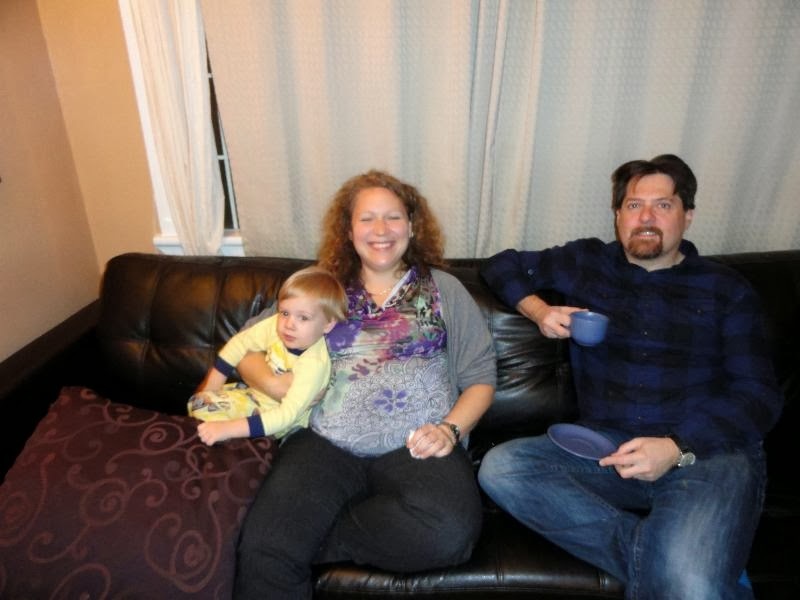 We also met their son, Alex for the first time. 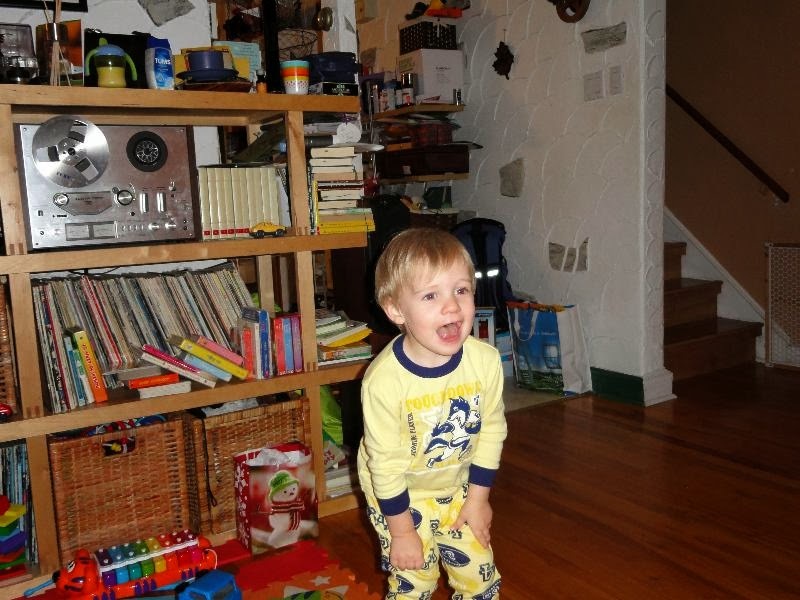 He's the cutest little boy. We really enjoyed the time we got to spend with them. Hopefully we'll see them again before our mission ends and meet the new addition. The third Sunday of the month is Soup and Sandwich Sunday. In November it also happened to be Elder Seaman's birthday, so I made him a cake. 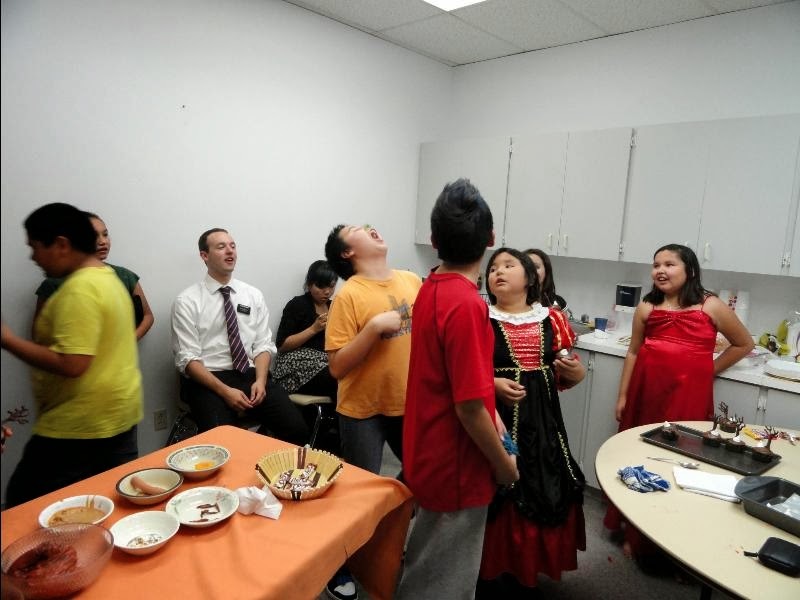 We also had the missionaries for supper that evening. I discovered this message after they had gone. 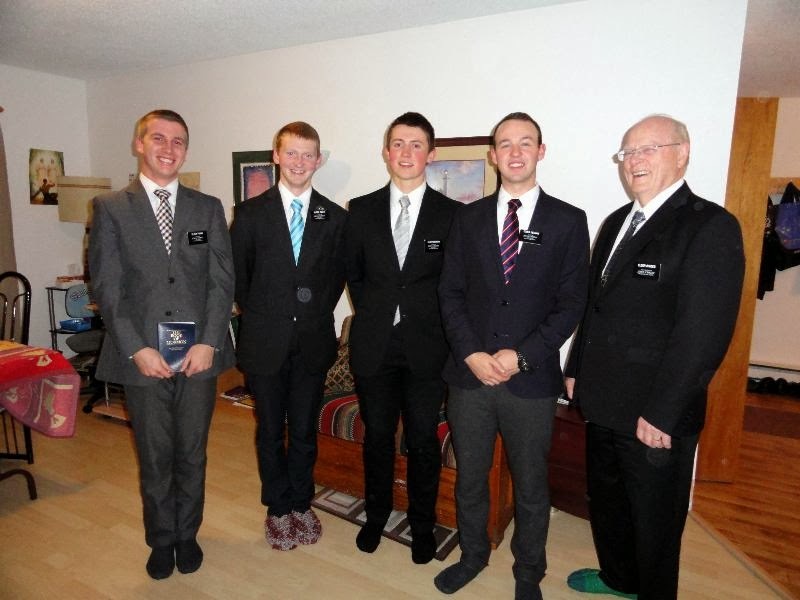 Transfer calls came at the end of November and Elder Boone Smith was transferred. So we had a goodbye supper with Sala and Madya, our neighbors from upstairs. With eight of us, we ate at the study table in the living room. We will all miss Elder Smith! Sala and Madya gifted him with a wooden Moroccan sculpture, which he greatly appreciated. This bunch of clowns gave me a hard time when I tried to get a serious last picture together. Out of seven shots, this was the best I could come up with. 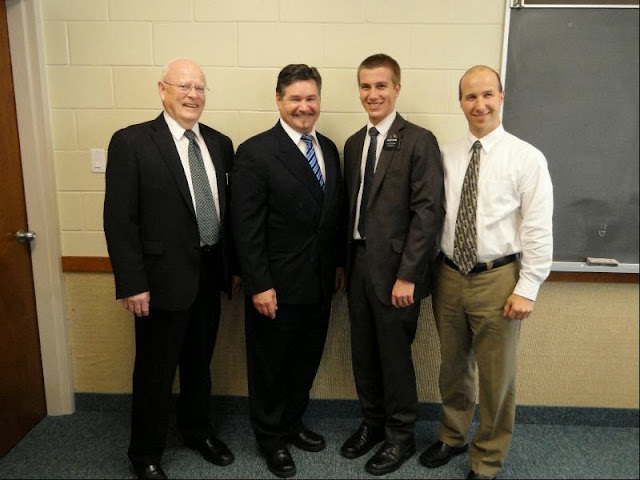 Elders Fronk, Smith, Newman, Seaman, and Rhodes. Goodbye to Elder Smith number 2! Well, I didn't quite get to the end of the year by the end of this year as I had hoped. But this is the end of the pictures in the computer and it takes us to the end of November. That's a far cry from how far behind I was not long ago. Hopefully I'll get December posted this week and will finally be completely caught up. This evening, when Sala and Madya realized we had been having trouble with the internet, they gave us access to their wifi! We will no longer have to rely on an unreliable connection! What a great gift with which to begin a new year of blogging! "We seldom get into trouble when we speak softly. It is only when we raise our voices that the sparks fly and tiny molehills of difference become great mountains of contention. The voice of heaven is a still, small voice; likewise, the voice of domestic peace is a quiet voice." President Gordon B. Hinckley, "Stand a Little Taller"